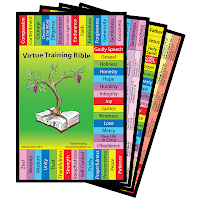 RGC is excited to be giving away a complete Virtue Training Bible kit! RGC reviewed the Virtue Training Bible last week and HIGHLY recommends the Virtue Training Bible. You can read the review here. This is one of the best tools I’ve ever come across to help train and disciple your children in the way of the Lord. Here are some photos of the actual kit you will be receiving, if you win the drawing. 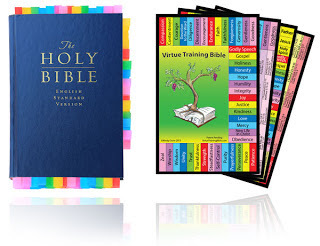 The kit includes a: Hard Cover ESV Pew Bible, Virtue Training Bible charts, markers and colored tabs. This is about a $40.00 value with shipping. I have the Child Training Bible. My son and I both love it. He was excited to see this new tool – he is 9. I would be so excited if we could get one. This would be wonderful! 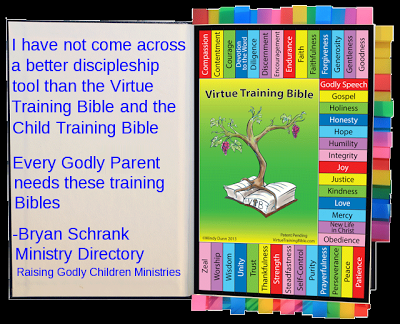 I already purchased the Child Bible Training and LOVE IT! I would love this. 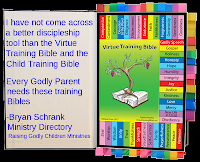 I purchased and put together the child training bible. I have recommended it to all of my friends. I want to thank you for making these products. What an incredible resource! I have been wanting to get one of these for a long time. I'm sure it will be a blessing for whoever wiins! Hoping to win a set for a gift for a precious friend. Ordered set for my family when it first came out. Still need to tab it. Would love to win this and try it with my kids. The videos are wonderful and make it look so easy. 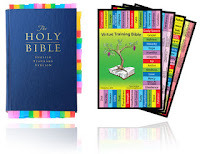 I would like to encourage people to make their own tabbed bible. This is a tremendously cool resource, but I have made my own, and it is so fun to do. And so beneficial to go through the scriptures on your own and look up what God's Word has to say about the things your family is dealing with. I would love to win a copy to see what scriptures or topics they included that maybe I missed, but if you don't win, buy one or make your own.